Ukrainian anglers Volodymyr and Anton started their fishing holiday in Thailand fishing for catfish at Bungsamran Lake in Bangkok. On arrival at the lake the anglers wasted no time in casting out sliding float rigs baited with large balls of groundbait. It was not long before Volodymyr was bent into a sizeable Mekong Catfish which proceeded to power off towards the distant bank. Continued pressure applied with the rod soon had the Mekong Catfish brought within netting range where it was expertly scooped up in the waiting landing net. Further casts saw both anglers hooked up with Mekong Catfish which fought every inch of the way to the net, with both anglers landing Mekong Catfish over 25kg’s. As the days fishing in Bangkok progressed the anglers steadily built up their haul of monster fish as the Mekong Catfish continually slammed into the anglers baited rigs. By early afternoon both of the anglers had landed over ten fish each with lots more Mekong Catfish weighing between 10-30 kg’s falling for their basic angling approach. After a quiet spell on the rods Volodymyr struck into a decent sized catfish which powered off on an extremely deep and determined run. Winding down into the rapidly departing catfish saw the rod bent fully into its parabolic curve and the tightened clutch of the reel still releasing line. A ten minute battle followed which saw Volodymyr skillfully keeping the Mekong Catfish away from the hazardous fishing platform stilts. Finally the Mekong Catfish surfaced just out of netting range gulping a mouthful of air before diving back down in the depths. The fish was once again brought up to the surface where it rolled over close to the fishing platform. On this occasion the guide wasted no time in scooping the monster catfish into the net and gently hoisting it onto the unhooking mat. 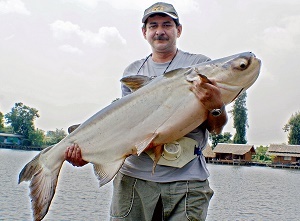 The Mekong Catfish was proudly held aloft for the camera and was estimated to weigh 35kg’s+. With still an hour or so of fishing time left the anglers continued to haul the catfish adding several more good sized specimens to their tally.